What if the People Who Don’t Know How to Do Trans Inclusion… Are Us? I want to stitch together a few experiences I have had recently, with a conversation Teri and I had on the way back from Chicago, where I was an honoree for the 2015 Trans100 on Sunday. None of these experiences are meant to call anyone out – rather, it is reflecting on a pattern that emerges, to me, from these experiences, that speaks about all of us, not any individual actor, but the culture and society we are building amongst trans people. It is not an attempt to pick a fight within the sisterhood (or, rather, among the trans siblinghood), but rather to try and have that crucial conversation that needs to be had. This is my Trans100 bio. I’m so amazed by the talent of the people chosen, and I feel more than a little unworthy. The first experience was months ago, at one of a series of workshops put on by leaders in the Michigan trans community. The workshops aimed to develop leadership and build and mobilize trans leaders. At the start of the first meeting, however, things went quickly off the rails. We had a brainstorming session in which we were asked to say what we needed to feel accepted, but it became quickly apparent that the designated note taker, who was putting the ideas on big sheets of paper that everybody could see, would write ideas in really big letters when they* liked them, and really small letters when they didn’t care about them. I pointed this out, and asked critically how we could have a discussion based on mutual respect if this is how we tried to develop mutual respect. One of the people there had an excellent idea, along with this, which was to foster the idea of assuming best intent in others, by having a simple protocol such as saying just, “Ouch,” when something bothered you, and if the person who said it understood why it offended, they could just say “Oops!” and move on (like you should do if you ever mis-pronoun somebody… just acknowledge it and move on). But there were soon a cacophony of “Ouches” that often had nothing to do with what the person talking had even been talking about. They culminated in a kind of surreal scene where one of the people present used what I can only describe as a Darth Vader voice to patronizingly point out to someone else that, if they were embarrassed about the way their voice sounded, they could change it with voice coaching or exercices (a point lost on nobody in the room). Later, we recovered from this, but there were still a lot of these weird moments. At one point in this series, we had an internal caucusing process. I had suggested a woman’s caucus, both because womanhood is the thing with which I most strongly identify, and because it created a potential home for the group of cis women who were participating. There was no interest in this, and I joined a trans caucus**. All fine and good, but then someone created a trans woman caucus, even though trans women were easily the largest group in the room, and the group would leave out both the cis women and some of the non-woman trans people who didn’t have a home. I didn’t feel comfortable with joining this caucus, because, in that space, it sounded a little bit like creating a white people’s caucus or a rich people’s caucus, or a men with power and influence caucus. The trans caucus, which ended up being Teri, me, and a really cool genderqueer / non-binary person, whom I love, was awesome (telling you, awesome caucuses are the only caucuses we should have). But I was left with this profound sense of not being able to belong to my own tribe – a sense I rarely feel when I am in broad LGBT spaces, and I never feel when I am in women’s spaces, or, amazingly, out in the “straight” world – all the places where I belong naturally. The second experience was at a recent meeting of our local trans support group, Own Your Gender. It was a little momentary interaction that didn’t fully hit me until later***. Wrapping up some group conversation about… something, I lightly said, “It could be worse. I could not be transgender.” One of the facilitators quickly corrected me: “You mean it could be worse, you could still be in hiding.” Sticking still to my pledge not to pick fights in the sisterhood, I sheepishly said, “Well, that’s true.” But I didn’t agree. I didn’t need correcting. I’m glad I’m not in hiding any more. 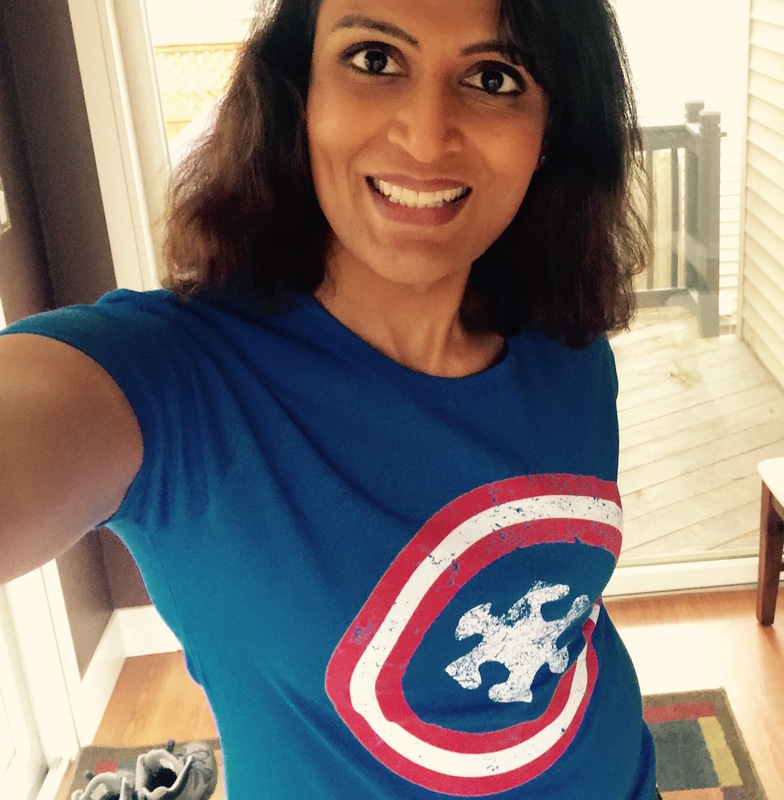 But I’m not just proud in principle, in a Facebook post on Transgender Day of Visibility. I am actually proud to be transgender. I love it, as I love life, and I am thankful for it. I was thankful for it even in hiding, although I am far happier living openly and authentically. I own this truth. Not as a weapon, and not to deny the experiences of our struggling siblings, but because it is my true experience. I have said it at the microphone to elected leaders and in front of large audiences, here on my blog, and in so many one on one conversations. I wasn’t fast enough on my feet, that day, caught off guard, to say it like it is, but it is true. And of all places where I should be able to say such a thing, our own spaces owe me the right to love myself in safety. If you know one thing about me, you should know I’m happy. That’s what lets me not spend my time surviving, but doing things like advocating for kids with autism. The third experience was going to the Trans100 itself. While there is always an “A-Gay” kind of phenomenon at national trans events, like First Event or Southern Comfort, this was very different from anything I’ve experienced before. Maybe it was night club culture (which I’ve always hated, for a wide variety of reasons, chief among them the way in which our women’s bodies become meat in a meat market, or in that it was a place where my charade as a “man” was most transparently not working). From the very beginning, I felt surprisingly unwelcome. At the ticket counter, when I said I had reservations and gave my name, the person hostilely asked me if I paid for a ticket, and waved me away. A bouncer nastily (and cryptically) told me, “Green is downstairs and orange is upstairs.” I genuinely had no idea what they were talking about, and so I asked what that meant. The response was, “Green is downstairs and orange is upstairs, that’s really all there is to it.” I still had no idea what was going on – I hadn’t ever been to the venue (I don’t think it was what it is now, back when I lived in Chicago), didn’t see anything green or orange, and orange and green didn’t mean anything to me. I had to figure out for myself that she was talking about the wristband I had, that I apparently had the “cheap seats,” and that she was there to keep me off the main floor. This is all fine and good, although this is an award others nominated me for, and I didn’t even know there were different kinds of tickets. I asked Teri (critically, not rhetorically) in some detail whether this is just me being a princess, and I finally came to the conclusion that it is really not. Because it wasn’t about me – yes, if I had been asked to buy more expensive seats, as a fundraising opportunity, of course I would have… I end up buying expensive gala and fundraising tickets, for one cause or another, it seems, for us, all the time nowadays. But it isn’t about that. I felt, the whole time I was at the event, that I was standing in someone else’s space, that the little tiny space I was occupying in my little tiny dress and my little heels was space that I should be giving up to someone else****. Really just the same way I feel as a woman on a crowded subway car. Teri, to my surprise, felt the same way. It isn’t about not being an “A-Gay” … I hardly expected the night to be all about me, as one tiny person among many being recognized. And I agree that, as one of the people who was being honored, that I am only a person chosen to represent an ocean of diverse talent, and that the celebration is not of us as the 100 “best” trans people, but a celebration of all the best in the trans community, with us agreeing to be used as exemplars or lenses through which that panoply of trans talent can be seen and celebrated. Yet, I also hardly think it necessary to work so hard to make me feel so unwelcome at what, even if only in a tiny way, was ostensibly my own party (and, of course, my own party in that we were celebrating trans lives, and the belief that trans lives matter, and so my trans life should matter, just for being a trans life), to accomplish this end. And if I felt unwelcome, as an honoree, how did people who were not being honored, who come from experiences of marginalization, feel? But it was the third thing that really started to put together pieces for me. 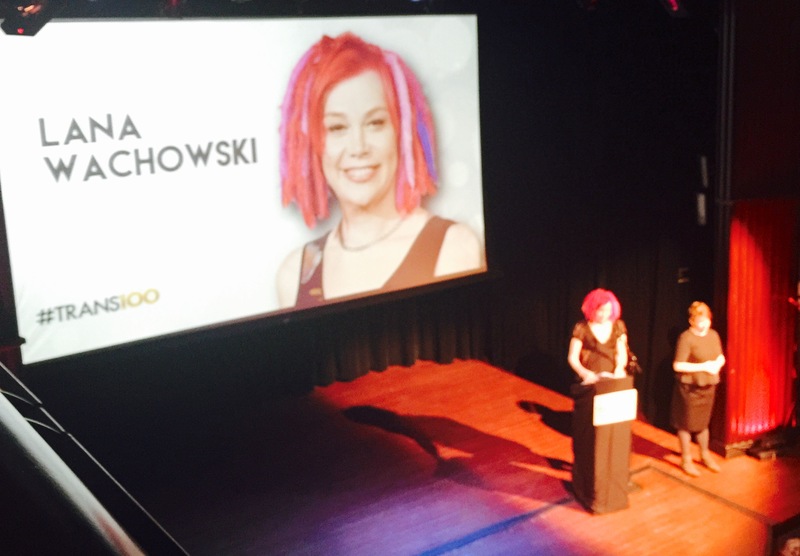 Lana Wachowski, who directed the Matrix and Cloud Atlas, was the keynote speaker. She made some excellent points, for instance stating of the world, “I don’t need your acceptance. I need your evolution.” She is a highly visible, highly successful, highly talented and creative, highly impactful trans person. She leverages all of these things to make the world a better place for other trans people, including by supporting in significant ways some of the critical work to safeguard trans people that is going on right there, in Chicago. But then, towards the end of her speech, she called out the black community for her perception that black people advocate “against us” for things like the odious bathroom bills. The tension in the room – we were seated next to a couple of our fierce black sisters, and I was really happy that the crowd that night was ethnically diverse – was palpable. A group of people, mostly black trans women, on the other side of the balcony, got up and walked out. We stayed, but all I was thinking about was how our black friends next to us, and the ones down on the main floor, and the ones across the balcony, were feeling, and feeling hurt alongside them. This was Lana’s Patricia Arquette moment. Precious Davis was on point and brought the night back to what it is really about, by saying that we need all our voices present in the room, to have the critical conversations that define us as a community. Later, some people I know called out the women and men who walked out that night, accused them of betraying trans people, but she was not doing that. No, she was calling them back in. That night, over a gyro and fries we split instead of going to the after party, because Teri was hungry, and because I needed to stress eat (which I didn’t admit to Teri till the next morning, and my eating disorder behaviors come out infrequently enough that Teri doesn’t always know them when he sees them), and then further cuddling in bed in the morning, and over lattes, we had a really great discussion that help me put the pieces of what I want to say together, into something that, at least to me, makes sense as a whole. That whole is this: we think that using preferred names and asking for pronouns is creating trans inclusive spaces, but the reality is that we, as a community, have no idea how to create an inclusive or safe space, for us. Rather, disrespecting trans lives is not just something that we need to hashtag to the outside world via #BlackTransLivesMatter, but we need to recognize that disrespecting trans lives is endemic in our own spaces and pervasive in our own processes and approaches. And this is perilous. Altogether too often, our own spaces are not safe for us. We see it in trans spaces where trans people are called out or made to feel unwelcome because they don’t do “enough to transition” or don’t “pass” or meet some other stupid and arbitrary criteria. We see it in trans spaces that operate as an oppression olympics and don’t allow for the possibility that a trans person can be happy, let alone happy to be trans. And we do it in spaces where we take glee in putting up velvet ropes and using bouncers to make people feel like they’re not good enough. Again, I say this with love and a sincere desire to keep Lana Wachowski and everyone else I mention, either by name or not, in this article, in the family, and to build a stronger and better family together with all of you. This is really not about calling out the Trans100. Jen Richards and all the people around her, who made this thing possible, did a really wonderful and revolutionary thing. The 300 people who have been honored, over the last three years, including me, share with all the talent and creativity and passion amongst trans people, the burden of elevating our profile, of helping us all learn to stand taller, chin up, prouder, fiercer. I am thankful, humbled, but also dead serious when I talk about being asked to shoulder a small part of that burden. This is also not about calling out Lana Wachowski. She has done, is doing, will do amazing things. She has tremendous power to be a force for good, and she has already done so much in her own way to lift us up as a people. On the contrary, this is doubling down on what Precious said, as well as what Tiq Milan said at the event, in his own excellent speech, which is in essence that just people like Laverne Cox on magazine covers (or people like he or I receiving awards or being asked to deliver addresses at events) is not going to be enough to stop trans suicide. We need to call everybody in, and at the core of the discussion we have, we need to talk about the fact that we don’t feel safe, all too often, in our own spaces. If we can’t feel safe in trans spaces, then we will just continue to have what we have now. A subset of fierce, happy trans people, like me, will go about their lives feeling safe and accepted outside of trans spaces, in mainstream society (as I do), and the people who are struggling, who have no place, … will face the ignominy of feeling unwelcome in the one place that has the least business rejecting them. This is an indictment, but it is an indictment of me as much as of anyone else. Just me being visible, being on TV (to talk about being transgender or to talk about autism), being happy, putting on tiny dresses and drinking cocktails, isn’t the revolution by itself. Sure, it might support other people who, like me, and many of other highly visible, successful trans people, didn’t need much to succeed except for people to get out of our way, but it isn’t going to help all those people who are contemplating, trying, or succeeding at suicide. I – we – have a choice in front of us… every community has hierarchies. In good hierarchies, leaders lift their people up. There is disparity, even in most of the best and safest places in the world, but only just enough, and it is far more often seen as a cause for those who have more to give more, than as a cause to take from the marginalized and give to the privileged. In bad ones, we create classes of toadies who use the power of the dominant subgroup to lord over others, or to take glee in creating velvet ropes and glass ceilings and all kinds of barriers that keep our own people down, and we seek to grow disparity rather than eliminate it. So what do I think? I think it’s time to tear down those velvet ropes, go out in the parking lot and get our sisters back in the room, and get down to figuring out what it actually means for trans spaces to be places where all trans people can feel safe, spread their wings, and fly. * I’m using gender neutral pronouns here not based on the preference of the person about who I am talking about, but just to keep this conversation about concepts and not about shaming or calling out anyone. ** The idea of an “awesome caucus,” composed of anybody who was awesome or wanted to be awesome, was also nixed, sadly, even though I and a friend fought hard for it. *** Yes, okay, it was basically this. **** There were exceptions – I talked to Laura Jane from Against Me, very briefly, and she was the epitome of not being the problem I’m trying to describe, and really served as a role model influence for me in that, much as people like Amy Gore had been at V to Shining V last year, or Lizz Winstead, also of Lady Parts Justice is, like all the time. And a couple of our Chicago friends grabbed us and made sure we got a drink early in the evening.